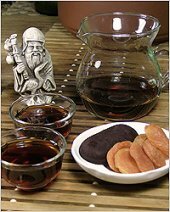 Has anyone of you, my friends, ever tried Pu-erh tea? I wonder so much, how you felt about it… This summer I had a chance to try a high quality Pu-erh tea, and it was some really weird experience, even for an advanced tea lover like me. Now, here’s the story. My brother Marc, who lives in Italy (where my family comes from), has been always making fun of my habit of drinking 6-7 big cups of tea a day. And, certainly, I have been always promoting excellent health benefits and beautiful tastes of various teas. This time he decided to prove me that not all therapeutic teas have a great taste, so he decided to send me some Pu-erh tea. He knew that I will not resist and try, in spite of warnings about its…well, a little unpleasant taste and aroma. Pu-erh tea (also known as Puer tea) is one of the oldest types of traditional Chinese teas produced from broad tea leaves (older variety of the tea plants) in Yunnan Province of China, where the famous Six Tea Mountains (Mansa, Manzhuan, Mangzhi, Gedeng, Yibang and Youle) are located. You can find Pu-erh tea both in loose leaves, but mostly it comes in compressed forms (bricks, bird nests, disc, bowl, etc.). So called cooked (shou) Pu-erh tea is produced by watering the tea leaves (to speed fermentation up), then leaving them to dry and transformed to back tea, and the raw (sheng) type undergoes secondary oxidation and fermentation (this type of Pu-erh tea is always sold as compressed). 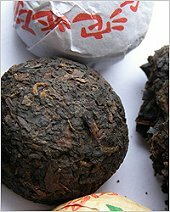 Pu-erh tea is known for its very powerful and unique therapeutic properties, which other teas do not have. First of all, regular consumption of only 1 cup of this tea can assist greatly in decreasing blood cholesterol level. Also, Pu-erh tea can alleviate the ailments connected with the digestive system. It contains huge amounts of antioxidants and, at the same time, it has quite low levels of caffeine. In addition, it assists in maintaining normal fat metabolism, therefore it an be useful in effective weight management. Finally, Chinese health care specialists also point on good antimicrobial properties of this tea. It is interesting the Pu-erh tea preparation requires initial steaming and removing the water, followed by the usual process of tea brewing. If you drink a high quality Pu-erh tea for the first time, it may taste quite robust. And you will definitely be disturbed by the smell coming from the cup of tea (to be very honest, after reading that the tea has “an extremely balanced flavour with a delicate sweetness reminiscent of Japanese plum“, I did not expect that it will have a distinctive whiff of a stable). Tea gurus say that you will like Pu-erh tea only in case when the tea have chosen you. Well, well – it seems to be true, and it seems that I was not the lucky one. Should I give it another try? Caffeine in Your Cup of Tea: Is It Harmful? I live in Penang Island, Malaysia and have been drinking pu-erh tea for the past 3 years. I am sure there must be a type of pu-erh that suits you. Recently i tasted a type of green pu-erh that had the sweetness of flower tea. Maybe you should try the raw type of pu-erh.